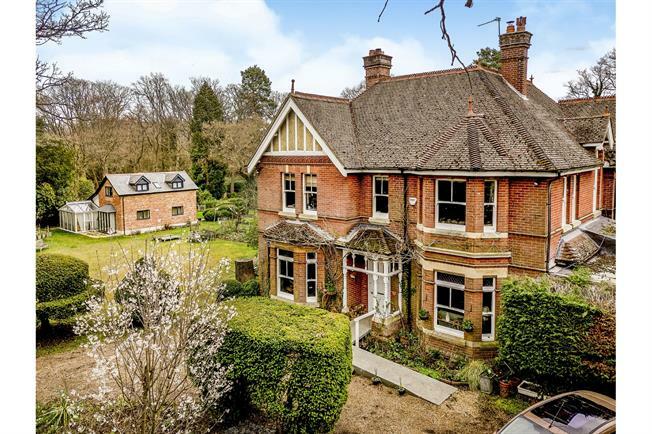 6 Bedroom Detached House For Sale in Woking for Guide Price £2,250,000. The house dates from 1894 and retains many original character features throughout. Our clients have owned the house for the past 25 years. One of the key attractions is the wonderful setting within three acres of gardens and grounds that also includes a detached two bedroom staff/guest cottage. There is an impressive covered outdoor heated pool complex with jacuzzi, shower, changing room. The house is approached from a private lane via a carriage driveway with ample space to park several vehicles.